I had one of the most delicious dips during the Thanksgiving holiday and I have been craving it ever since. 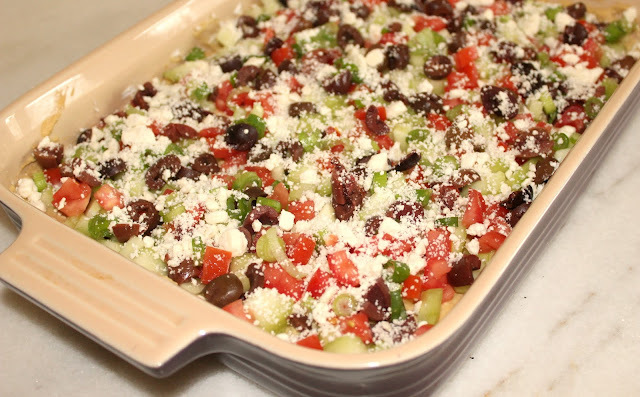 My husband's aunt made this Greek 7 Layer dip as an appetizer and it was devoured in a flash. It's very light and flavorful, and doesn't leave you feeling too guilty about snacking. I knew I had to make it the first chance I got, so it made an appearance on New Years Eve, and a few days later for a friend's birthday. It's super simple and takes no time to make. I just can't get enough of this stuff! 2. Add dried dill and lemon juice, mixing well until light and fluffy. 3. Spread the cream cheese mixture in the bottom of shallow baking dish. 4. Next add a layer of hummus, spreading evenly on top of the cream cheese. 5. Add diced cucumbers, covering the top of the hummus. 6. Add a layer of diced tomatoes. 7. Next, add a layer of Kalamata olives. 8. Add a layer of green onion. 9. Sprinkle the crumbled feta cheese all over the top. 10. Refrigerate for at least 2 hours before serving. Holy yum! Loved this recipe...thanks for sharing! Thanks! :) We need to all get together so we have an excuse to make all those yummy appetizers again!